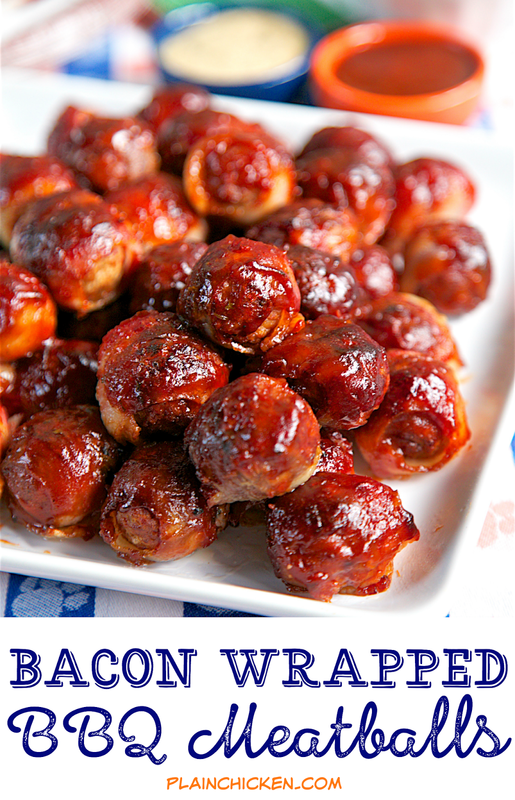 Bacon Wrapped BBQ Meatballs - only 3 ingredients! SO easy!! I took these to a party and they were gone in a flash! Could serve these over rice for lunch or dinner. The Super Bowl is next weekend, and I am in full meal planning mode! 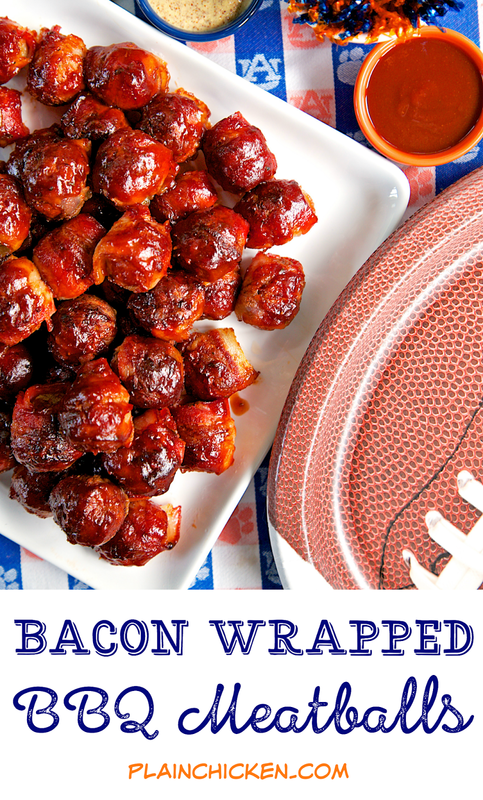 One thing that I know is definitely going on the menu are these Bacon Wrapped BBQ Meatballs! They only have 3 ingredients and they taste great! I took these to one of our tailgates this year and they were gone in a flash! 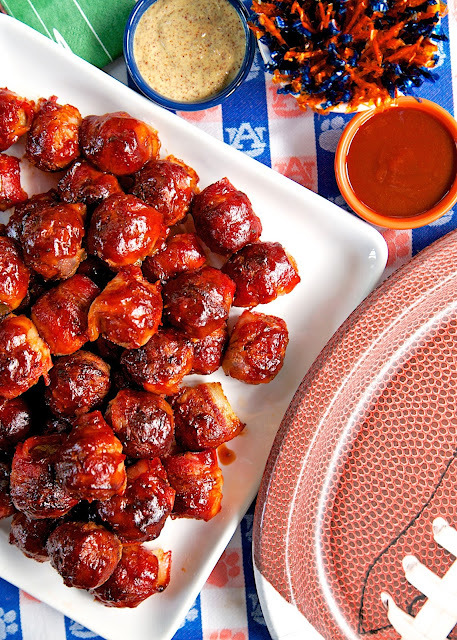 If you don't tailgate, you could make these and serve them over some rice as a meal. I would totally eat these for lunch or diner! YUM! I loved how easy these were to make! I used frozen meatballs, but you can make your own if you prefer. I didn't want to spend a lot of time making party food. I think the frozen meatballs taste great and you can't beat the convenience! Cut bacon into thirds. Wrap bacon around each meatball. Place on prepared pan. 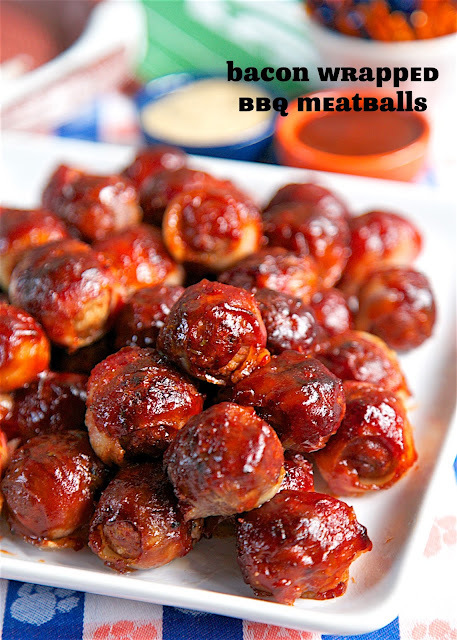 Brush meatballs with some of the BBQ sauce. Bake for 15 minutes, brush with more BBQ sauce. Continue baking for an additional 5 to 10 minutes, until bacon is starting to crisp. Remove from oven and brush with remaining BBQ sauce. Just to be sure, are the meatballs thawed first? Or should you prepare these while they are still frozen? We do ours partially thawed, just soft enough to get a toothpick through to hold the bacon.